I remember the day I was transformed! I was sixteen years old and I knelt next to my bed and accepted Jesus. Looking back I was young and had no idea that I would need Jesus as much as I did and I do. See my Mom was very sick back then and it was Jesus that got me through those tough times. When she went to heaven it was that assurance that I would meet her again that got me through. I jump ahead and a bit off topic. Transformation is the topic at hand. See when I met Jesus that day I was a changed person. Some things became easier - like praying and trusting in Him and some things because a challenge. See my sin (drinking, smoking, foul language) didn't feel so good anymore. I didn't have to give those up but I did because there was no enjoyment in them anymore. It wasn't an overnight change - which my highschool friends would attest too! However it was rather drastic like night and day! Am I happy to be transformed? Absolutely! I love this life that God has given me - ups and downs. I love Jesus and I am happy that people that knew me back then see a new and different creature just like the Bible says they will. They say proof is in the pudding and I want my testimony to be proof to who I have become because of Jesus in my life. 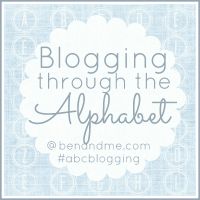 This post is part of blogging through the alphabet with benandme.com. I am happy to be transformed by Jesus Christ also!